Prepare to be enticed this season by our three restaurants' distinct culinary offerings featuring fresh, summer ingredients. We caught up with executive chef Karl Blunden who takes us behind the scenes and into the kitchen as he tells us a little about himself and wows us by demonstrating how to make The Reefs' signature summer dish - Bermuda Rock Fish right at home. Chef Karl, how long have you been head chef at The Reefs? I've been working at The Reefs for 15 amazing months. Out of all your responsibilities, what is your favorite part of your job as Executive Chef? The daily challenge of keeping our menus fresh and modern and thinking of new ways to enhance our guests' experience would be at the top of my list. In the kitchen this summer, what is your favorite ingredient to cook with and why? My favorite ingredients would have to be fresh seafood and Asian spices. Living in Bermuda gives me a great deal of fresh, local fish which allows me to create great fresh dishes for our guests. Plus I love to cook Asian inspired food using authentic Asian spices and vegetables. Okay, tough question, what is the most popular dish at The Reefs right now? Coconuts' new lunch menu has the "Mr. L's Fish Sandwich", created by one of our Chef de Pastries with an old family marinade recipe. It's currently our number one selling item for lunch. People really can't get enough of it! What is your favorite dish this summer and can you share the recipe so our readers can have a piece of The Reefs at home? Sure! 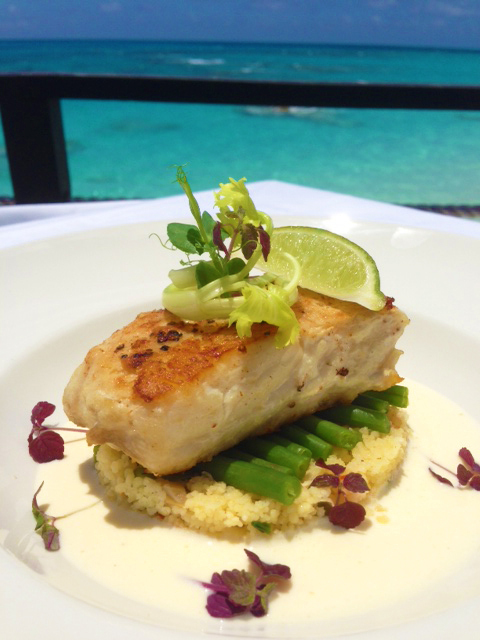 The Reefs' signature summer dish has to be our Bermuda Rock Fish. Caught locally on the island, this light, flaky fish accompanied by a summer cous cous salad is the perfect meal for dining al fresco, whether at Coconuts or your own outdoor paradise at home. Place the raw cous cous into a stainless steel bowl, when you are nearly ready to serve add boiling water just cover the cous cous. Adding just enough water to cover the cous cous this will ensure that it comes out perfect every time. Once you have added the water do not stir - cover with cling film and leave for 3 minutes for the grains to absorb the water. After 3 minutes have passed, remove the cling film and gently run a fork through the mixture to break it up, then add the white crab meat, thinly sliced baby fennel, diced tomato, chopped parsley, diced carrot, juice of half a lemon and salt and pepper to taste. Stir well, check the seasoning, cover again and set to one side and keep warm. If Rock Fish is not available, Black Grouper is a good alternative and readily available at most fish mongers and major supermarkets. Season the fish with salt and pepper then cook the fish in a little olive oil and butter to get a nice nut brown color then turn the fish and cook in a moderate oven for 8-10 minutes or until cooked through. Heat the wine, ponzo and chopped shallot slowly and bring to a simmer. Once the mixture has been brought to a simmer, add the cream and slowly cook for another 1-2 minutes, do not boil the cream once it has been added to the wine or the sauce will break. Next begin incorporating the butter a little at a time stirring consistently until all the butter has been gently added to your sauce. When the butter has been completely added, the sauce should coat the back of a spoon. To finish the sauce, add the juice of half an orange, season with a little salt and pepper then pass through a sieve to remove the shallots. To assemble this dish, first add the cous cous mixture into the center of your plate then top with sautéed French beans, add the fish to the top of the beans, coat with the Ponzo beurre blanc, garnish and serve.